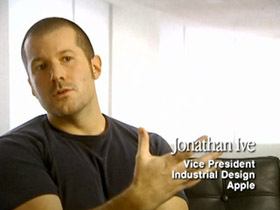 Who Is Jonathan Ive? is BusinessWeek’s in-depth look at “the man behind Apple’s design magic.” Ive usually stays in the shadows so it’s interesting to read more about his background and process. They work closely and intensely with engineers, marketers, and even outside manufacturing contractors in Asia who actually build the products. Rather than being simple stylists, they’re leading innovators in the use of new materials and production processes. The design group was able to figure out how to put a layer of clear plastic over the white or black core of an iPod, giving it a tremendous depth of texture, and still be able to build each unit in just seconds. It started with the first iMac…To understand how to make a plastic shell look exciting rather than cheap, Ive and others visited a candy factory to study the finer points of jelly bean making. They spent months with Asian partners, devising the sophisticated process capable of cranking out millions of iMacs a year. The team even pushed for the internal electronics to be redesigned, to make sure they looked good through the thick shell. This push for innovation in manufacturing is a big reason why Apple changes the rules of what’s possible. Most companies buy off the shelf stuff which means things look and feel the same (i.e. usually like crap). Apple’s efforts to discover new materials and production processes enables them to build things no one else can build. There’s a parallel here with software too. The best hackers understand that they can not only change their programs, but they can also change the language that defines and limits the programs they write. An example close to home is Ruby on Rails. Our products are built out of Rails. But it’s not a one-way street. Our team is constantly looking at what can be changed and improving Rails based on what the products need to do. It’s a team that has worked in idyllic comfort for many years. Some designers were at the company long before Ive arrived in 1992. They rarely attend industry events or awards ceremonies. It’s as though they don’t require outside recognition because there isn’t any higher authority on design excellence than each other. This award apathy sounds familiar. Getting Real is all about iterations too. “Be excited to be wrong because then you’ve discovered something new” is a neat way to put it (btw, so is Fail early, fail often). By the time he graduated, Ive was already something of a legend in British design circles. Grinyer visited him once in his flat in the very tough Gateshead section of Newcastle and was shocked to find it filled to the rafters with hundreds of foam models of Ive’s final project, a microphone and hearing aid combo that teachers could use to communicate better with kids with hearing problems (not surprisingly, in white plastic). “I’d never seen anything like it: The sheer focus to get it perfect,” recalls Grinyer. Robert Brunner, then with Lunar Design, was floored when Ive showed him an elegant question mark-shaped phone — not just a foam block but an actual model with all the internal components machined separately. “It wasn’t just that the product had heart, but it was engineered; he was thinking about how to make it in volume,” recalls Brunner. For more on Ive, check out this Design Museum interview with him where he talks more about how materials/processes drive design. Materials, processes, product architecture and construction are huge drivers in design. Polymer advances mean that we can now create composites to meet very specific functional goals and requirements. From a processing point of view we can now do things with plastic that we were previously told were impossible. Twin shooting materials - moulding different plastics together or co-moulding plastic to metal gives us a range of functional and formal opportunites that really didn’t exist before. The iPod is made from twin-shot plastic with no fasteners and no battery doors enabling us to create a design which was dense completely sealed. Metal forming and, in particular, new methods of joining metals with advanced adhesives and laser welding is another exciting area at right now. I went through college having a real problem with computers. I was convinced that I was technically inept, which was frustrating as I wanted to use computers to help me with various aspects of my design. Right at the end of my time at college I discovered the Mac. I remember being astounded at just how much better it was than anything else I had tried to use. I was struck by the care taken with the whole user experience. I had a sense of connection via the object with the designers. I started to learn more about the company, how it had been founded, its values and its structure. The more I learnt about this cheeky almost rebellious company the more it appealed to me, as it unapologetically pointed to an alternative in a complacent and creatively bankrupt industry. Apple stood for something and had a reason for being that wasn’t just about making money. I wonder if Apple has a interface designer on par with Ive. Who’s the UI figurehead over there? I think that, especially evidences by your last post on itunes, there isn’t that person there. It feels like it’s a different person as the decision maker every time an interface issue or evolution occurs, whereas with the hardware, it’s been the same guiding hand for awhile now. Jon Gruber has written quite a bit about Apple’s deviations from it’s own interface specifications over at daringfireball.net. Talking about UI design, it suprises me that 37signals - a company claiming to be UI design experts don’t know that having widows is a major faux pas … as seen in the headline for this post (“The man behind Apple’s design ***magic***”). True, widows is technically typesetting. But then again, many would argue that design does not exist without type. So it’s a moot point. Same is your example of turning off the stylesheet. With stylesheets on or off, there shouldn’t exist widows … and even with the stylesheet off, you can have widows. One thing we’ve never claimed, nor would ever claim, is that we’re perfect. Widows aren’t pleasant, we agree. Yes, they can be dealt with with plugins or rewriting blog post headlines, but it’s not worth the energy right now. I have a real respect for designers who have as much interest and skill in the technical issues of what goes inside their products, the practical experience of using the product, and what goes into manufacturing them as they do in the outside shape. So often you see showcased concept designs where all they seem to have done is cast a mobile phone into yet another bizarre shape just for the sake of it, or suggested some impractical and useless new mode of style of operation that hasn’t been thought through in the context of the real world. Ah, yes, no battery doors on the iPod — don’t you have to throw it away once the battery dies? I think the iPod’s design is overrated (but there’s still a lot to like about it). I really like my Powerbook, but, Apple, why oh why do you have to have so many damn different keys (fn, ctrl, alt/option, apple, enter) yet *no* backspace key (yes, I know about fn+delete — yuck)? All in all, I agree with the post — it’s high time engineers get a sense of *style*. Beauty and ease of use matters. Look at cars. While I like the design of and the materials used for the MacBook I’m somehow disappointed of the construction itself. It feels really cheap because everytime you put the MacBook in a bag or just close the lid it cracks. Same thing with the Touchpad button. The leve of responsiveness is not the same depending on where you push it. It’s ok on the right side but somehow squishy on the left. Before getting too off-topic I really appreciate the design process of Apple products. Unfortunately this is worth nothing if quality assurance is not on the same level. I think this is ok with software because you can easily fix things with an upgrade. With software this process is much less of a hassle than with hardware. There you have to send in your expensive piece of hardware for repair, which often takes weeks. For what it’s worth, the last Doug comment was not posted by me. If your going to quote it at least read it and understand it. Having widows is a major faux pas in the in the typesetting world. Your nit is esthetic not UI. * Output, allowing the system to produce the effects of the users’ manipulation. Howay man! Ay divn’t knaa he’s from Gateshe’d! Ga Unit’d! I just like how brilliant people of like minds and focus are somehow drawn together and the synergy is pure invention and innovation. I think the new Shuffles look awesome and I’ve already ordered one (which won’t ship ‘til early November much to my chagrin :(), but I swear I saw an mp3 player in Akihabara in 2002 that was no bigger than the new Shuffle. As I remember, it was about 1”x1”x ~1/2”, chrome blue and probably around 256kb; so I’m a little skeptical that the new Shuffle is the world’s smallest mp3 player. Ah, yes, no battery doors on the iPod — don’t you have to throw it away once the battery dies? Nah. It’s a bit of a chore to swap the battery, but there are guides all over the ‘net. Is it the uniform of Apple for everyone to wear a black shirt? And jeans too. Turtleneck shirt style optional. Discussing both hacker innovators in the form of language developers and iterations in the design process got me thinking. What would you say is the time frame between scrapping a newly developed language and starting over, or undergoing a major new “iteration?” You have to balance the time required for creation and aquisition vs. the usefullness of a new language, but I think it should be on a yearly basis. I’m sure there are times when you guys say, “Man I wish Rails did this a little bit differently.” Don’t get complacent with Rails v0.1! Widows might be painful on the eyes, but I think that the focus is rightfully kept on content and not small tweaking everything. It is very hard to resist editing and re-editing every post until everything is completly perfect, though..